I’ve been eating shawarma in some form for years now. In fact, one of my first dates with John was at a little Mediterranean cafe in Kansas. We ordered shawarma and fed each other bites between adoring glances. Yes, we were that couple. That was also the day I discovered John’s preference for small bites and my overwhelming preference for big bites. I felt like he was slighting me all night. Don’t worry – lesson learned, the relationship survived. Take note world (and husband): Give me a two-biter or things are gonna go down. Shawarma is essentially defined as a roasted meat sandwich. Therefore, some people might say “chickpea shawarma” can’t even be a real thing. To such people, I say, “Go away, naysayer. Chickpeas are delicious and satisfying and I can make a shawarma sandwich out of them if I please.” Hmph. This recipe is easy, requiring just 30 minutes, plus simple ingredients and methods. Plus, one sandwich (of two) boasts 22 grams of protein! Hello, plant power. If you make this recipe, let us know what you think! Leave a comment and rate it, and don’t forget to take a picture and tag it #minimalistbaker on Instagram so we can see! Your pictures always make our day. Cheers, friends! 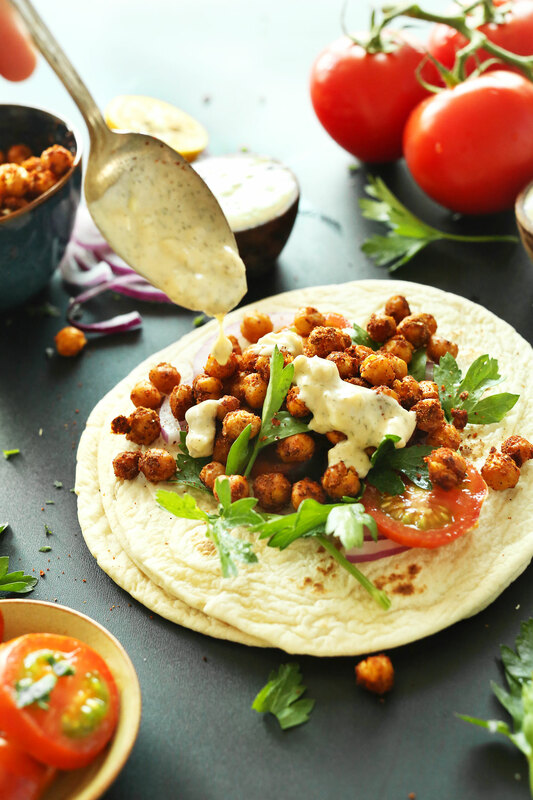 Amazing, 30-minute Chickpea Shawarma Sandwich with spicy baked chickpeas, a creamy Garlic Dill sauce, and lots of fresh vegetables. A healthy, quick, and satisfying plant-based meal! Preheat oven to 400 degrees F (204 C) and line a large baking sheet (or more if making larger batch) with foil or parchment paper. In a small mixing bowl toss rinsed and dried chickpeas with oil and spices and spread on baking sheet. Bake for 25 minutes or until slightly crispy and golden brown. Once slightly cooled, sample and adjust seasonings as desired (I added a bit more sea salt, cumin and garlic powder for extra flavor). While the chickpeas are roasting, prepare your sauce by adding hummus, lemon juice, dill and garlic to a mixing bowl and whisking to combine. Add enough water or almond milk to thin so it’s pourable (~2-3 Tbsp as original recipe is written // adjust amount if altering batch size). Taste and adjust seasonings as needed. Add more garlic for more zing, salt for savoriness, lemon juice for freshness, and dill for a more intense herb flavor. I found mine didn’t need anything else. 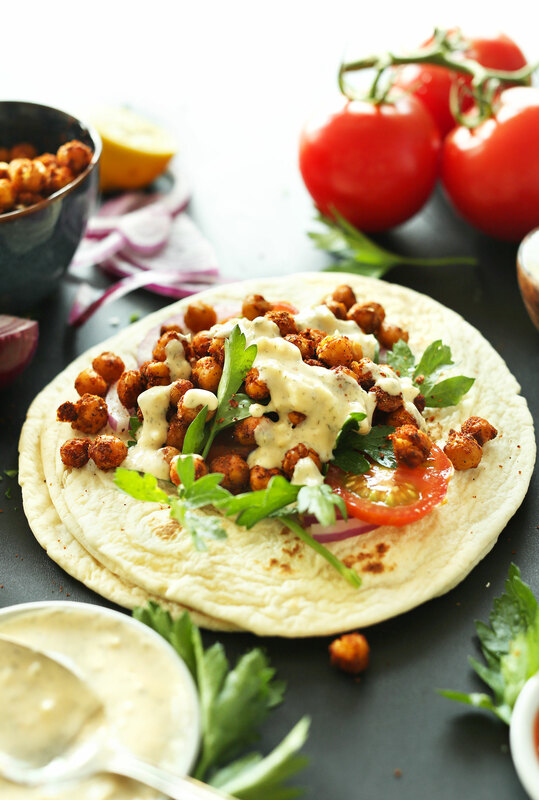 To serve, warm pitas or flatbread in the microwave for 15 -30 seconds (or the still warm oven for 1 minute) and top with desired amount of chickpeas, sauce, and vegetables of choice. Best when fresh, though leftover chickpeas and sauce will keep well stored separately in the refrigerator for 3-4 days. *If you don’t have hummus, tahini will make a great base substitution for the sauce - just adjust the seasonings to accommodate the lack of flavor tahini provides. *Nutrition information is a rough estimate calculated without optional sea salt, with the pita bread, but without other serving ingredients. So easy and satisfying. I just made a quick batch to take for lunch this week (serving on whole wheat tortillas with the dressing, tomato, onion, and cucumber). As the chickpeas were cooling I cought my boyfriend sneaking a few. He said, “do we have another can of chickpeas so you can make those and I’ll eat these?” High marks considering he is decidedly anti-vegetarian/vegan. Minimalist Baker recipes are definitely helping him learn that plant based meals are delicious too! So glad to hear you enjoyed this, Trish! Thanks for sharing! Yum!!! My husband and I are doing keto so we served this up on a net 3 carb tortilla and added roasted red pepper, avocado slices and cucumber sliced lengthwise. BIG HIT!!! Soooo flavorful!!! We can do a little hummus and chick peas/garbonzos and this satisfied his craving for Middle Eastern! I work really hard keeping our keto interesting so he doesn’t feel deprived. My husband has nicknamed me his Texas Scheherazade 🤗 !!! Thank you for providing me with great options!!! Hi, I’m from Kansas and I LOVE THIS RECIPE!! I’m very curious about where the Mediterranean restaurant that you went to is? I would love to go and experience it for myself!! I adore this recipe!!! Made it tonight and my 3 kids ate 2 each!!! I used naan bread as my wrap. I didn’t have any coriander, but aside from that I made the chickpeas exactly as written. I used garlic roasted tahini instead of hummus for the sauce, but since we like garlic a lot I still added one minced garlic clove. I thinly sliced purple onion, mixed power greens, and sliced tomatoes on top. I also squeezed fresh lemon on top of my wrap. I did try adding a little bit of Siracha to one bite of my sandwich because I like spicy food, but I thought it took away from the delicious flavor so I didn’t try it again . I plan on adding this to our rotation of meals at least once a week! Yay! We are so glad you all enjoyed it, Luisa! Thanks for sharing! I made this again tonight and while the flavor was delicious, my chickpeas were way too roasted! I did use a different brand of chick peas, and actually took them out of the oven 5 min. early….but other wise everything was the same. Any idea what I should do differently next time? I’m new to cooking and was looking for a simple but tasty chickpea recipe. I made this and it turned out delicious! I didn’t have any lemon juice for the sauce but it was still good, served with arugula in a pita pocket. Thanks! I made this only because I accudentky opened a can of chick peas earlier this week; I thought they were white beans. I was not prepared to be impressed. But it was actually amazingly good! I will be making it again. I made this recipe and my husband and I loved it. I found the dried dill to be a little strong so next time I’m going to try substituting fresh dill. Also, I already had some pickled red onions in the fridge so I used those instead of the raw onion slices, but I love red onion so either of those options would be great. Other than that I followed the recipe as written! The chickpeas are amazing. I’m going to make another batch of those just for snacking! Thank you! Made this last night–ate it too quickly to get pictures to share! It was amazing, the garlic dill sauce was so good. I didn’t have hummus but had tahini, so I used the other half of a lemon to thin in place of water/almond milk. I have a bit leftover for tonight’s supper. Thanks for this delicious recipe! Yay! Glad it was a hit, Amber! A favorite at our house- we love this recipe. Super quick and we usually have all ingredients on hand. Roasted chickpeas have changed my life. Thank you! Devour we did! The flavors are incredible. Chickpeas are good all by themselves but adding the veggies, chili sauce and dill sauce take it to a whole different level! Made your pita wrap recipe too and it is wonderful. Thanks for the great recipe! We will be making this one again and again! Woot woot! We are glad to hear you enjoyed them, Audra! Super easy to make and very flavorful. This will definitely make it into the weeknight rotation. This was absolutely delicious (I love the garlic dill sauce)! Super easy to make, too! I made this and it was really good and also easy! This recipe has quickly become one of our favorites. We make it at least once a month, usually more often! Plus, the garlic dill sauce is incredible. We make it whenever we make falafel too! Thanks for the great recipes! ? I made these two nights in a row for my partner and I, cause they are so damn delicious! And on top of that very quick and easy to make! I did add a bit extra of all the spices for the chickpeas to give it an extra kick. So happy I found this recipe, thanks for sharing!! I am trying to adjust to a more vegetarian lifestyle (after eating meat at every meal for my entire life), and this was a perfect segue. Fills you up with the protein in the chickpeas, and that dill/garlic sauce is delicious! I topped mine with tomatoes, lettuce, and onions, just like the recipe suggested…yum. If you can eat dairy, a homemade tzatziki sauce would really take this to the next level. Also, I was skeptical of the chickpea schwarma because before we became vegan chicken schwarma was our favorite thing to have for dinner. But, as soon as we took the first bite, we were so happy we hadn’t lost out on one of our favorite meat based recipes. Now we can do schwarma, vegan! I made this yesterday for lunch, saved the leftovers for lunch today, too. This is the best sandwich I have ever eaten. I will be making it again. And visiting your site again. There isn’t a flatbread listed. You have any suggestions? Doesn’t need to be vegan. Thanks! My husband made this for me today and it was sooo delicious! I kept saying wow the whole time. I just had to ask him where he got the recipe. Thank you for such an awesome recipe! I absolutely love all your recipes! I have been wanting to limit my meat intake and your veggie dishes have made it so easy for me! I really appreciate them! Thank so much! Sooooo tasty! Made these for dinner then enjoyed the leftovers for lunch. They were incredible! Used green chickpeas for them instead and they turned out amazing! Thank you so much for your delicious recipes!!! You have helped me love my plant-based, cruelty-free diet! I have made these several times now and my family loves them! We even make them for special dinners when our carnivore company comes over and they are a huge hit. I love how the recipe is so simple but the flavors are just so bold and intoxicating. This is truly one of our favorite dishes of yours…so far. I am trying to implement more plant-based meals into my diet. This recipe was delicious and easy. Highly recommend it, especially for beginner cooks. I made this for lunch today, pretty much as written. I added chopped cucumber and some tempeh for a bit of extra protein. The garlic doll sauce was AMAZING! Yum! Delicious. Only change I made was to use greek yogurt for the garlic dill sauce. My husband & I loved it! Used tahini and doubled the amount of seasonings. Made it for dinner yesterday, and again for lunch today – just couldn’t resist! Well I am not vegan, but enjoy clean eating. This was fantastic. We avoid grains for the most part so we are this on romaine lettuce wraps. Amazing, fresh flavor from this dish!!! This will go in our standard rotation. For the sauce, I had no hummus (nor spare chickpeas to make my own) or tahini, so I used milk kefir. It was incredible. Can I make this with fresh soaked chickpeas ? Will I need to boil it in salt Water first? I have a huge 4 lb bag at home that I want to use. Hi! Fresh soaked chickpeas will work well! This was killer – my only change was to soak the red onion in vinegar first. This will be a regular dish in our house for sure. Another great dish from Minimalist Baker – thank you! This is now yet another one of my favorite recipes Dana! I forgot to get romaine, so I substituted ? avocados! I used pita bread, but looking for other types! Making again tonight! I made this tonight and it was absolutely incredible. Thanks for the recipe. Where did the bread come from? I am going to make these this weekend if I can find the sone good pita bread. I had am amazing roasted chickpea wrap in Boulder a few weeks back and I’ve been crazy craving it ever since! This recipe is just so good. In fact, I can’t even remember what that other wrap tasted like. My new go to..and I even added double cinnamon and coriander. Thanks! Anyways, I just made the wraps, and they are really tasty, light, yet filling. I doubled up on the chick peas and sauce as I used this as part of my Meal Prep Day. They both still came out tasting delicious. Thanks for this recipe and I will definitely be checking around your website for more ideas. I made this tonight and absolutely loved it!!! So easy, tasty flavors that went well together. Thank you for this recipe. to be honest, i made it today and wasn’t overly impressed. I probably left the chickpeas in the oven for too long, since they came out VERY hard and difficult to eat. however, thumps up for the idea and the seasoning! Your recipe turned out perfectly. I am transitioning to plant-based and this satisfied my cravings. I used tahini and the sauce was great. Thanks!! This was AMAZING! All of your recipes are awesome, but I especially loved this one. Made it for din last night and will prob make it again for lunch today. On a side note, have you considered coming out with a meal plan service? You are by far my fave veg blogger and I think of your recipes often when I’m contemplating joining a meal plan service, they just never quite make the cut for me after I’ve tried a few of the recipes. Please consider it!! has anyone found a good quality pita brand without weird preservatives like calcium proprionate? I make this at least once a week now, I absolutely loveeee it. The cinnamon was surprising, but so necessary! This was so good. The garbanzos were nice and crispy, almost giving it a meat like texture. And the sauce was great, i even had extra garbanzos and sauce for snacks the next day. My entire week was planned from recipes from your website. And for that I will always thank you. Having a chic peas in flafal can be amazing if its boiled well and spiced up. I used to order chick peas flafal in latvia style, but it wasn’t really spicy, I have been finding at many places but I couldn’t find, but there’s one place called Visiedieni, really love to eat chic peas in flafal. I made this and it turned out delicious! Will definitely make again. I’ve had my eye on this for a while and just tonight got the chance to make it. Fan-freaking-tastic. Thank you for all of your delicious recipes! Um, yum! Made this for my 6 adults as well with your Greek guacamole on the side. Everyone loved it and all asked for your recipe. Thank again! Yay! Thanks for sharing, Rebecca! 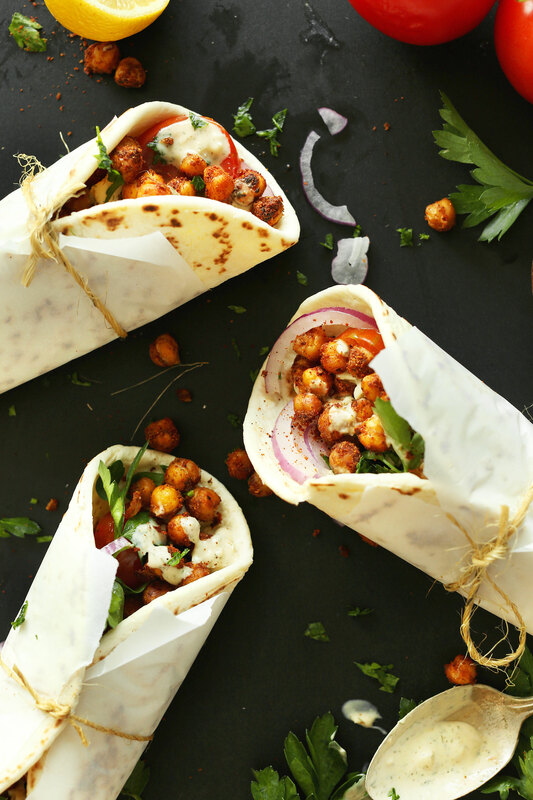 this looks AWESOME- I was wanting to make a chick pea wrap and this is the one !!!!!!!!!!! Favorite recipe on the site! I’ve made it numerous times. I was intrigued by this recipe until I saw the nutrition information stated 1200 mg of sodium…From where does all the sodium come? I would still like to try the recipe, but without all the sodium. Thanks. Amazing, thank you so much for this recipe! I suggest adding 1/4 tsp of powdered cayenne pepper to the garbanzo seasoning, and also some thinly-sliced cucumber medallions for extra crispness. This has to be one of the most delicious things I have made in a long time! I am glad I had the foresight to double the recipe. Thank you so much! Now I’m excited to try more if your recipes. Yum! Just made this for dinner (looking for a quick dinner and all I had were chickpeas in the house and found this on pinterest) – huge hit! Everyone loved it and said it needed to be made again. Served with pita, cucumber, diced tomatoes, shredded lettuce, and feta (for nonvegans). Easy, quick, and delicious!! Oh My Goodness! I just tried this wonderful recipe tonight (after seeing it in my Facebook newsfeed), I knew I’d like it (huge shawarma fan), but I didn’t expect my super picky kids to like it, and they ate every bite, and even told me I should make it more often! (well except the 6 yr old, he wouldn’t even try it, since it didn’t come in a McDonalds happy meal box, or look like a peanut butter and jelly sandwich) But the other two, and my husband loved it! This recipe is just amazing! I tried it yesterday and I immediately fell in love with it! So delicious ! Wishing you a good week from Québec! I just made this for the family and they absolutely loved it! This comment is from a person that absolutely hates to cook. In the kitchen I am terrible but these recipes are easy and fantastic. Thanks very much for your website! Sounds wonderful… but I think I might skip the pita & (& the gluten & extra carbs) & serve it as a salad over greens. I’m new to vegan eating and was craving meat so when I came across this recipe on your website I knew I had to make it. For the flatbread, I made your vegan garlic herb flatbread. I also added chopped green apple, avoacdo and shredded red cabbage to the sandwich and sprinkled with Sriracha. Seriously delicious!! I can’t wait to make this for my family. I just made this, the recipe was so easy to make and tasted sooo good! Thanks for this, I’ll be making it again. Love all of your recipes, everything I’ve made has turned out great. Can’t wait for the book! This is a phenomenal recipe. My wife and I loved it and shared it with our vegan friends. The chickpeas turned out so delicious – even our one and a half year old devoured them as well, he had seconds and thirds. I’ll definitely be making this again. Do you have trick for drying out chickpeas from a can? I’ve even tried wasting endless amounts of paper towels and when I roast then they are still a little soggy and no crunch? Do you take yours out a lot of hours before? Incredibile, awsome recipe! I made it one hour ago and was delicious – i’ve changed some things, because i did not had dill and almond milk, so I put fresh mint and instead of almond milk I put some plain yogurt. Thank you for your lovely recipe and for sharing the recipe with us. This is more than cool! I tried it and I just finished it! There are no leftovers left! I made this last night and it came together so quickly! I loved all the flavor, and how much protein it packed in. Ah, thanks for sharing! Glad you liked it, Laura! I don’t like to use chick peas from a can. I usually buy dry chick peas, soak them and then pressure cook them. I am wondering for the chick pea roast should I put them in the oven straight after soaking or should I cook the soaked chickpeas and then put them in the oven to make them crisp. Any ideas? Thanks! I would cook them, then bake them! Just made this for the second time in about 3 weeks. It’s been awesome both times, great flavors and super easy. I used hummus that I made the day before, made a big salad and put it all together with the dill sauce on top. It one of our new favorite dinners! So wonderful! Thanks for sharing, Danielle! I love how simple and delicious this recipe is! I just threw this in the oven while my coconut milk ice cream was churning for a quick snack. Thanks! This looks amazing! Does the nutritional information you provided include the flatbread or is that extra? Thank you!! I’m a recent convert to veganism and, truth be told, I’m struggling to leave some of favourites behind – chicken shawarma was an obsession of mine. I can’t wait to give this a shot in the near future. Just the smell of the spiced chickpeas roasting in the oven is enough to make me want to whip this up every week. This was just as delicious as it was fragrant and I’m recommending it to all my friends. I haven’t made one recipe of yours that I didn’t DEVOUR! So excited to try this one. Question, though — I’m trying to cut down on oils, so I was wondering if you had any substitutions for the oil used here! Peace and blessings! This was excellent! I used your 5 Minute Microwave Hummus recipe as the base for the sauce and stuffed some pomegranate mint slaw in the pita pockets with the roasted chickpeas. It was ethereal. Another Minimalist Baker 5 star recipe? You bet I pre-ordered that cookbook. ? Is this sandwich better warm, room temp or could be eaten right out of the fridge? Shawarma was one of the main things I was so sad to give up when I decided to stop eating meat! There is a family-run place near where I live that my dad and I have been going to for ages! I will definitely miss their wraps, but this recipe might just be the answer to my prayers! Definitely pinning this for later! Thank you! If it’s totally delicious – you can call it anything you want. It’s totally delicious- so you’re fine. Made this tonight and it was so good my child licked her plate, thank you! Your vegan recipes are the best! So kind! Thanks for sharing, Sabrina! Great recipe! I’ve made these two separate times, and will be making a third batch soon. The garlic dill sauce is a wonderful addition, as always. You’ve inspired me tonight! I did a variation of this for our tea: roasted butternut squash, tomatoes and chickpeas, with the seasoning from this recipe. I loved the look of the garlic dill sauce but didn’t have hummus or tahini in, so I improvised and used silken tofu instead, in the blender. It was delicious! I only stumbled across your site a month ago, when I found the tofu lemon fruit tarts, and I absolutely love your recipes. I’m not even vegan but wanted to eat less meat, and was struggling for inspiration, but you’ve certainly given me that. Oh wow! I have to get some of those wraps! Could I share this on my blog? 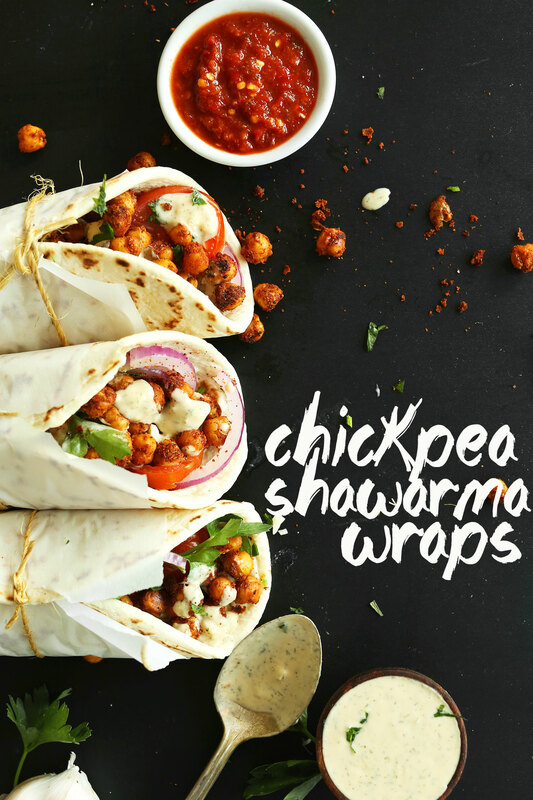 I LOVE the idea and I have a feeling shawarma spices would taste so good with chick peas. I may recommend Spice of Zara’s shawarma spice mix to go with it. Of course, I will link back and credit throughout the post. Looking forward to your reply. This is going to get made this week.I think my kids would love it.Is it ok if I use dried chick peas to roat?-If that is the case do I just soak them or soak and cook them? Also if this were to be packed for lunch do you think it would hold up? My tween simply loves your baked goods! Just finished eating this. Delish! And for those who are sensitive to legumes like myself, a note. I pan fried a bunch of veggies(redonion/garlic/peppers/mushrooms) and used that as the ‘filler’ with maybe a 1/4 or less of the chickpeas sprinkled on top. With the sauce, it’s still packed with flavor and quite filling. A little pickle takes it to another level! Definitely will make again! I made this earlier this week and it came out really well. I decided to substitute Zaatar for dill (I was itching to use it) for the sauce and I like it. I will definitely try dill the next time. The first night I ate the fillings in a pita bread and for the rest of my meals I put everything on a bed of salad greens, which tasted great. I will definitely make this again. Thanks for the sharing! Made these last week, and they definitely turned out great! You’d maybe have to add a little more spice to your chickpeas, but it’s just a matter of taste. As a meat eater I didn’t feel the lack of animal protein in that wrap. The sauce was good, even if it’s the same one than in at least three other recipes on this website, it’s still working reaaally well. I just don’t get how hers turns out white, and mine kinda beige (just like the hummus that’s in there), I just don’t get it (does she have a magic white hummus?). Final thought: good recipe, even for non-vegan, filling, healthy, balanced, and super tasty! you gotta give it a try! Did you use a nut milk to thin the sauce, or water? I use cashew milk, and it always comes out a nice white color. Mine turns out white even when I’m lazy and use water! ? I LOVE Roasted chickpeas! Will be making this tomorrow!! Let me know how it goes, Kendra! simple yet healthy recipe.. Amazing presentation! The Honey had heart surgery (he’s now perfect again!) so we’re always looking for non-meat goodies that are loaded with protein, fit with the Mediterranean “Diet” and don’t seem like a substitute for anything. This recipe nailed it. Thanks so much for the inspiration. So wonderful! Glad you enjoyed it, Lizzie. Best of luck (and happy healing) to you! Out of curiosity what was the Mediterranean cafe in Kansas called? I live in Kansas and I love Mediterranean food! I just made this and actually instagrammed a pic of it! Amazing! So…just…amazing. Simple recipe to follow. Great meal if you don’t have much time and need something tasty try it! So glad you liked it! Thanks for sharing, Lauren! Yay! So glad you liked them, Dalila! I’m like ugh I dunno what to make for dinner then I see your wonderful posts and all my problems are solved! i love chickpea shawarma sandwish so much!!! I made this tonight for me and my family. We all loved it which is amazing since there is usually one in dissent. Thank you so much. You have been a God send since we switched to a vegan diet. Ah, thanks Eiji!! So glad you all enjoyed it! Mmm love vegetarian meals like these. The chickpeas are so simple to make. Can definitely see myself eating these with some tzatziki! I’ve drooled over so many of the recipes you’ve made with roasted chickpeas, and have wanted to try them so bad! Lucky for me I found one can of chickpeas in the pantry just waiting to be roasted! I just finished making and eating this and it was very delicious! Unfortunately I didn’t have any pitas or flatbread at my house, so I put the chickpeas and sauce on top of my salad and it was a success! I will definitely be trying the roasted chickpea and sweet potato salad! So glad you enjoyed it, Alicia! Hi Rosey! That’s kind of the nature of them :D SO glad you enjoyed them though! Ooh this sounds SO good! 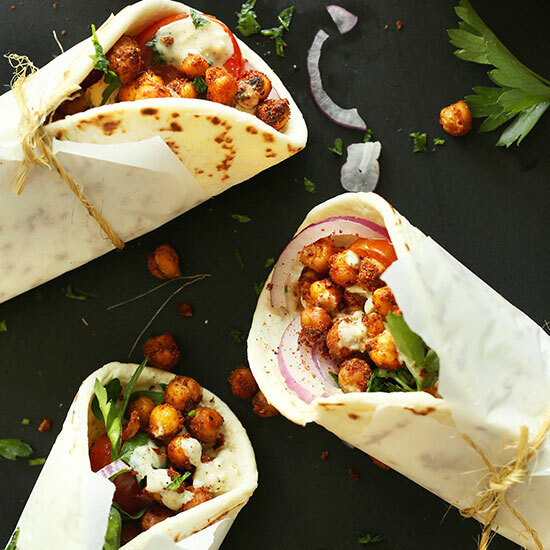 I’d never even thought chickpea shawarma could be a thing! It’s such a genius idea! Dana, you have done it again. Everything I have made from your site is absolutely phenomenal. I made these for dinner tonight, and my husband and I are seriously impressed. It’s such an easy recipe, and we had all of the ingredients minus the pitas and some fresh produce to slice up for toppings. Thank you for being you. Thank goodness you and John made it through the bite business. Such things would tear other couples apart. ;) We’re all grateful you lived to tell the tale and bring us this amazing recipe! Looks delicious but I hate dill. I really, really want to like it but I don’t. Any suggestions for a good substitute? What kind of flatbread did you use? It looks so soft and pillowy. I believe that one was from Traders! My dinner plans just got changed to this delicious looking recipe! Can’t wait to try it. This looks FANTASTIC!!! Do you think Sesame Oil would work? It will definitely affect the flavor, but yes! I’ll probably just use EVOO until I get what the recipe calls for. Thank you for the response and ALL of the great recipes! Plants FTW! These look soooooo yummy, Dana! This looks delicious!! I agree with the person who talked about throwing in some pickles. Yum! I only have one question… can I sub the grapeseed/avocado oil with olive oil? Or any other type of oil? Yes! Any neutral oil will do. I CANNOT wait to try this…too bad I already have something in the crock pot! Um… yum! This looks incredibly delicious. I love how you roasted the chickpeas, and the garlic sauce sounds incredible. This looks way more beautiful than any picture of shawarma that I’ve ever seen! Great recipe as always! Thanks Sydney! Hope you give it a try! Lovely…this is dinner tonight! Next up…an easy recipe for healthier and/or gluten free flatbread, please! Done – Tasty and easy! Was able to find a flatbread recipe that I liked…put these together, paired with a massaged kale salad, et voila… even the kids loved these. Seems recipes bring me to your website often…thanks a bunch! Wonderful! I’ll add a flatbread recipe to my list! Thanks, Angelica!! Absolutely awesome! I have never heard from that dish before and as soon I can eat back again (my wisdom tooth were taken out yesterday) this will def have a place on my To-Do list! WOW! What an epic recipe! Can’t wait to make this this weekend! Oh heck yes. I used to have a serious love affair with chicken shawarmas and to be honest this looks waaaaay better!! I always use to get mine loaded with pickles so I might have to add some when I make this! Just finished my amazing dinner! Thank you for being an awesome resource as a start out on my vegan journey, it’s only been a couple months and people are already asking me to advise them in their own explorations. You are definitely a top recommendation on my list! Thanks again, your hard work has simplified my life. You’re the best! 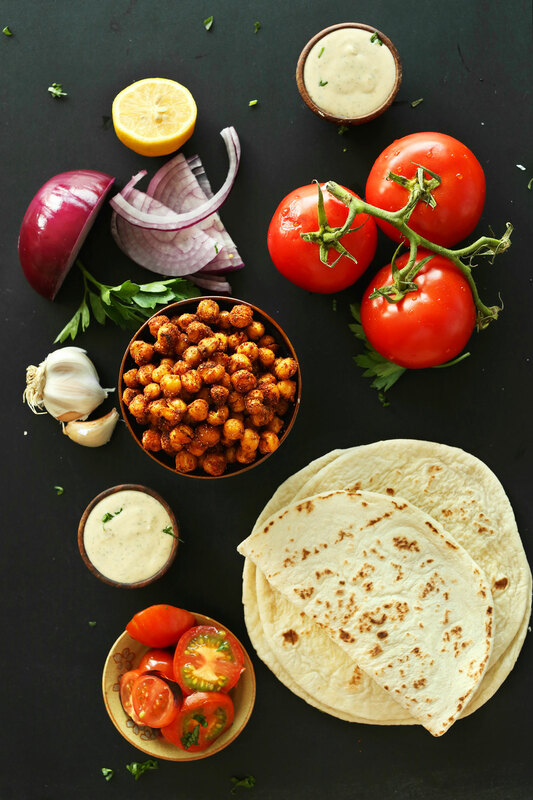 I’m digging the many, many roasted chickpea recipes you create. Roasted chickpeas are my favvvvv, so keep them coming! How does your stomach/intestines tolerate half a can of chickpeas at once? I can barely tolerate 1/4 cup :( I love them but they don’t love me. This sandwich looks great! I have a couple close people in my life that can’t tolerate legumes…i feel for them…they are my fave food, couldn’t live without ’em. It varies person by person! I can’t eat something like this *every day* but my stomach tolerates legumes pretty well for the most part! I’ve never tried roasted chickpeas in Shawarma but we have a few local shawarma places that do a great falafel and that’s often my favourite pick. The garlic dill sauce looks awesome too, I can’t get enough dill this summer! Me either! Dill is THA best. Hope you love this one! This looks amazing. Why have I never tried Shawarma before? I think this needs to change, starting with this recipe! This looks truly amazing! My son loves roasted chickpeas but I usually just give them to him as a snack. This looks sooo much better! That was my though. SO much easier than falafel! Hope you loved it, Krystal.